In terms of size, the Falkland Islands' land area measures up to be about the same as that of Northern Ireland. Population-wise, though, the place has less than 3,000 people (there's a 2,000 strong military population as well), granting it an isolated feel. The fact that the nation identifies politically and culturally with the United Kingdom, an ocean's length away, emphasises the isolation. It goes without saying that visitors don't come to the Falklands for a party atmosphere. The islands' wildlife is their main attraction: penguins, a huge variety of birds, sea lions, seals, dolphins and killer whales swarm in, above, or next to the Falkland waters. A handful of small towns are on the two main islands of East and West Falkland. These offer some interest of their own, but mostly it is the uninhabited coastal and countryside areas that have the greatest appeal. Controversy exists as to who first discovered the Falkland Islands, with competing Portuguese, Spanish, and British claims in the 16th century. While Amerindians from Patagonia could have visited the Falklands, the islands were uninhabited when discovered by Europeans. The first reliable sighting is usually attributed to the Dutch explorer Sebald de Weert in 1600, who named the archipelago the Sebald Islands, a name they bore on Dutch maps into the 19th century. Sovereignty over the islands became an issue in the second half of the 20th century, when Argentina saw the creation of the UN as an opportunity to pursue its claim. Talks between British and Argentine foreign missions took place in the 1960s but failed to come to any meaningful conclusion. A major sticking point in all the negotiations was that the inhabitants preferred that the islands remain British territory. A result of these talks was the establishment of the islands' first air link. In 1971, the Argentine state airline LADE began a service between Comodoro Rivadavia and Stanley. A temporary strip was followed by the construction of a permanent airfield and flights between Stanley and Comodoro Rivadavia continued until 1982. Further agreements gave YPF, the Argentine national oil and gas company, a monopoly over the supply of the islands' energy needs. The Falkland Islands are located in the South Atlantic Ocean on a projection of the Patagonian continental shelf about 463 kilometres from the Patagonia coastline and slightly to the north of the southerly tip of Cape Horn and of its undersea extension, the Scotia Arc. In ancient geological time this shelf was part of Gondwana, which around 400 million years ago broke from what is now Africa and drifted westwards relative to Africa. The Falklands, which has a total land area is 12,173 km2) and a coastline estimated at 1,288 kilometres, comprise two main islands, West Falkland and East Falkland and about 776 small islands. The islands are heavily indented by sounds and fjords and have many natural harbours. The two main islands are separated by the Falkland Sound. East Falkland, which contains the capital Stanley and the British military base at Mount Pleasant, is the more populous of the two main islands. Both West Falkland and the northern part of East Falkland have mountain ranges that are underlaid with Palaeozoic rock, which, as a result of secondary forces associated with continental drift are at 120° to each other. The highest point of the islands is Mount Usborne, 705 metres on East Falkland, while Mount Adam on West Falkland is only 5 metres lower. The southern part of East Falkland, the Lafonia Peninsula, which is connected to the rest of the island by a 4-kilometre narrow isthmus, is dissimilar to the rest of the island. Most of Lafonia is a flat plain underlain by younger Mesozoic rock, but in the north west is Permian rock which is similar to that of parts of Ecca Pass in South Africa. The Falkland Islands consist of two main islands, East Falkland and West Falkland, and approximately 776 smaller outlying islands. East Falkland (Isla Gran Malvina) is where the capital of Stanley and the majority of the population are. West Falkland (Isla Soledad) is populated by fewer than 200 people. Smaller islands include Barren Island, Beaver Island, Bleaker Island, Carcass Island, George Island, Keppel Island, Lively Island, New Island, Pebble Island, Saunders Island, Sealion Island, Speedwell Island, Staats Island, Weddell Island, and West Point Island. An island with such a name makes it very obvious what this island is famous for. But apart from the sea lions there is much more wildlife to explore on the most southern island of the "Islas Malvinas". The best of getting here is on a flight by the government air service. Getting around can be done on foot or by a good 4wd and most people go here on some sort of package. Wildlife includes sea lions, elephant seals, gentoo, rockhopper and magellanic penguins, cormorants and numerous other birds. Others that you might see are orcas offshore and sometimes king penguins. Even a small play of golf is possible! On the other side of the Falklands, located in the north there is Pebble Island which can be reached by government air service as well. Much of the island includes numerous ponds and therefore this island is one of the best for birding. Many species of penguins and cormorants all breed here, and species of swan and duck can be find here as well. On top of the wildlife, the island was the site of major combat during the Falklands war, with several memorials and some plane wrecks as reminders of this conflict. The largest beach of the Falklands can be found here as well, although needless to say that swimming is less popular than let's say on Tahiti. Another island, located in the extreme northwest, is Carcass Island. Also good for birding, this island is special because it is one of only a few islands which hasn't got rats or cats. Therefore, several species of birds which are hard to find (or even absent) on other islands, can be found here, like large flocks of songbirds. Seals, sea lions and penguins join the club as well on one of the many beaches. Well, other sights and activities are more or less the same, as there are so many islands to choose from and many islands have chartered government air services. Just pick your favorites, the above three are just examples. For some city life, go to Stanley, but after a few hours you want to go back to where you came from. One of the calendar’s most exciting evenings sees people spilling out of bars and house parties around Stanley and Camp as they celebrate the past twelve months and welcome in a new year. Stanley’s locals are out in full force and firework displays are often held in the camp areas. Traditionally celebrated at the end of the sheep shearing season, Camp Sports Week in February is a time when the local Falkland Island families get together, relax and host barbecues for a few days. Numerous events, such as horse racing and dog trials are held annually and it’s a great way to experience rural life. For a more active event, head over to the Falkland Islands during March and sign up for the world’s most southerly marathon. The course offers some fantastic scenery to keep runners occupied along the way and while it’s known for being fairly challenging, it is not only a great workout, but a fantastic way to discover the Islands. For centuries, May Day, which falls on the first of the month, has been celebrated by the British emigrants on the Falkland Islands. While not quite as popular as it once was, the locally-orientated festival is centered around the symbolic Maypole and includes Morris dancing and the crowning of a May Queen as one of the highlights. The festival dates back to the pagan beliefs of the Anglo-Saxons. A proud and symbolic day for Falkland Islanders, June 14 celebrates the end of the Argentine occupation of the archipelago. A memorial service is held at Christ Church Cathedral, followed by a military parade and ceremonial laying of the wreath at the Liberation Monument. Although it is no longer a public or national holiday, Falkland Day, held on August 14, celebrates the first noted discovery of the islands by John Davis in 1592. It also celebrates the noisy return of the elephant seals and black-browed albatross to the islands to breed. Similar to celebrations held in the US, Halloween is the perfect excuse to dress up and act like a child on the night of October 31. Plenty of the local establishments throw costume parties and a wide range of themed baked goods are available in all of the local bakeries. The Falkland Islands have mild climate but warm days are rare and temperatures of 20 °C are not very common (the highest ever recorded was 24 °C). That said and given the southern location, temperatures are not that cold in winter either (record low off -11 °C), but the constant wind doesn't feel that nice for that matter and strong westerly winds are almost constant. Average highs range from around 4 °C in July to 13 °C in January and February. Lows average between -1 °C in June, July and August to 6 °C in January. It is more likely to rain in the southeastern part of the islands, with the far western islands being very dry actually. The best time to visit the islands is between November and March, when temperatures are highest. Port Stanley Airport (PSY) near the capital is where all international flights arrive and depart. LanChile has flights from Punta Arenas in southern Chile. There are also flights to and from the British Antarctic Territory. Taxis and a shuttle bus can drop passengers off anywhere within the town. There are no regular passenger services other than expensive cruiseliners and expeditions vessels that travel to and from the Falkland Island. Often, such a trip combines the island with Antarctica and the South Orkney and South Georgia Islands. Sometimes, ships even continue to Tristan da Cunha, Saint Helena and Ascension Island. Falkland Islands Government Air Service (FIGAS) operates non-scheduled flights between the different Falkland islands. Destinations from Mount Pleasant International Airport near Stanley include Sea Lion Island, Saunders Island (also from Sea Lion Island) and Pebble Island (also from Saunders Island), but there are loads more. Planes usually seat 8 to 12 people. There are no trains on the Falkland Islands. There is only one tarred road linking Stanley, Mount Pleasant International Airport and Goose Green. An all-weather track also links Mount Pleasant with Goose Green and Stanley with Port Louis, Estancia, Salvador and various settlements in the north of East Falkland as far as Port San Carlos. A similar track on West Falkland links Port Howard, Chartres, Fox Bay, Hill Cove and Roy Cove. A 4wd vehicle is really needed on these roads, as some roads can be slippery after rain. You can rent one in Stanley and several other places, either with or without a driver. Traffic drives on the left and your national driver's licence will be sufficient. Mostly availabe between the airport and Stanley, but on demand also between other places where roads exist! There are many ways of chartering boats, either from Stanley or one of the smaller islands. Usually, it is much more convenient to arrange things with a tour operator or guides, available in Stanley. With the exception of those arriving by cruise ship who will not be spending a night on land, all visitors to the Falklands must show that they have a return ticket, accommodation and sufficient funds to cover their expenses while in the islands. A major credit card will be accepted as proof of funds. A departure tax of £22 is charged when leaving the territory from Mount Pleasant airport. Visitors arriving on board a cruise ship and do not spend a night in the Islands. Visitors who hold a passport from the following countries: Andorra, Argentina, Australia, Austria, Belgium, Bolivia, Brazil, Canada, Chile, Cyprus, Czech Republic, Denmark, Estonia, Finland, France, Germany, Greece, Hong Kong, Hungary, Iceland, Ireland, Israel, Italy, Japan, Korea (Republic), Latvia, Liechtenstein, Lithuania, Luxembourg, Malta, Netherlands, New Zealand, Norway, Paraguay, Poland, Portugal, San Marino, Slovakia, Slovenia, South Africa, Spain, Sweden, Switzerland, Taiwan, United Kingdom, United States, Uruguay, Vatican City. Visitors who have a passport or international travel document issued by the Red Cross or United Nations. The Falkland Pound (FKP) is the national currency, set 1:1 against the British Pound (GBP). A work permit is required for any foreign national, including UK citizens, working in the Falklands. Work permits should generally be applied for prior to coming to the islands and will require an employer's sponsorship. Falklanders speak the British variety of English. 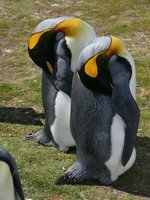 There are a handful of words that are unique to Falklands English. Despite the islands' proximity to the South American continent, Spanish and Portuguese are not spoken except as foreign languages. Meals in the Falklands are primarily traditional British. Fish and chips, roast beef, mutton and tea are standard fare. There are some Spanish influences such as Milanesa and Casuela. While in camp many of the lodges provide home-cooked meals in very generous portions and their food is generally better than is found in Stanley's pubs and cafés. However, Stanley does have a few good restaurants. It is difficult to find fresh fruit and vegetables, and they are generally very expensive. A banana will cost £1 and a small orange or one single plum will cost 90p. Cabbage and cauliflower costs around £4.50 for half a portion. Half a portion of lettuce costs around £3.50 and a small cucumber costs £4. Tomatoes for some reason are very expensive, if you buy 2 small tomatoes that will set you back £2.50! There is no fresh milk available and all milk is UHT/long life milk. The only fresh meat on sale in the supermarket is mutton. A frozen chicken costs around £12 for a 2kg bird. Accommodation in Stanley includes numerous bed and breakfasts as well as a handful of hotels. Buildings are generally older and the warm hospitality also seems to come from a bygone age. While in camp lodging includes everything from old farmhouses to lodges built specifically for tourism. Camping may be permitted with permission of the landowner. Many places are self-catering meaning supplies will need to be purchased in either Stanley or from a local source, if one is available. When in camp it is essential that lodging be reserved in advance; in Stanley it is generally possible to find lodging without a reservation but it is still recommended that reservations be made. While most items in the Falklands are expensive due to the cost of importing, there are no taxes on alcohol making beer prices fairly reasonable. Pubs and lodges offer a wide selection, although most drinks will usually come from a can or bottle rather than a tap. There are no vaccinations legally required to travel to the Falkland Islands. It's a good thing to get your vaccinations in order before travelling to Falkland Islands. The general vaccination against Diphtheria, Tetanus and Polio (DTP) is recommended. Also a hepatitis A vaccination is recommended and vaccination against hepatitis B and typhoid are also sometimes recommended for stays longer than 3 months. Crime is relatively unknown in the Falklands, although one should still take the normal precautions of not leaving items unattended or travelling alone late at night. If problems are encountered the police force should be helpful. Unexploded ordnance from the 1982 conflict, including land mines, are still found in the islands. No civilians have been harmed by landmines since the conflict ended, and the remaining minefields are all well marked and clearly cordoned off. It is a criminal offence to enter a minefield or to remove minefield signage. Many animals in the islands can be dangerous when cornered or with young. Elephant seals, sea lions and fur seals are probably the most dangerous; keep a safe distance when viewing these animals. A general rule is that if the animal seems to notice your presence, you are too close. The Falklands, being located at a far southern latitude, may be affected by the Antarctic ozone hole from August until December. During this time be sure to wear sunscreen on sunny days, as the risk of sunburn is increased significantly. During other months of the year the ozone hole shrinks and the danger from the sun is not significantly greater than anywhere else on the planet. However, it is wise to wear sunscreen as the burning effect of the sun is often under-estimated by visitors to the islands. Several hotels, as well as the visitor centre offer computers that accept Cable & Wireless internet cards and there are an increasing number of Wi-Fi hotspots. For all emergencies, including Police, Fire, Ambulance and Bomb Disposal, dial 999 free of charge. The country code for dialling the Falklands is +500. The local phone company, Cable & Wireless, sells phone cards which can be used throughout the territory but international calls cost £0.90 per minute. Broadband internet access now exists island-wide although speeds are much closer to dialup, 56 Kbps or less. Both phone and internet cards can be purchased from the Cable & Wireless office in Stanley (located on the hill past the War Memorial), as well as in some of the stores in town. The larger lodges will also sell phone cards and may have internet cards. More recently a GSM cell phone network has been made available but works only for Stanley, Mount Pleasant and a few other locations on East Falkland. The postal service in the Falklands is reliable and letters can be mailed easily from Stanley and most settlements. The main post office is located in Stanley town centre across from the FIC West store. I wouldn't honestly regard myself as being qualified to be a Helper - I don't live there and only visited once, for two weeks five years ago - but as there isn't one at all at present, I may be better than nothing! People are welcome to ask, and I'll help if I can. Use our map of places to stay in Falkland Islands to explore your accommodation options and to compare prices across the country at a glance. To narrow the results down by budget category, use the links below. This is version 16. Last edited at 9:31 on Jul 12, 17 by Utrecht. 14 articles link to this page.